On Saturday, July 28, 2012 the most respected minds in the cocktail industry will gather to recognize national and international nominees across 17 prestigious categories. After a thorough selection process, the top four finalists have been chosen for the Annual Spirited Awards® Ceremony. The Spirited Awards® honors the bars, bartenders, writers, experts and other members of the cocktail industry who have exiled above their contemporaries for the 2012 year. 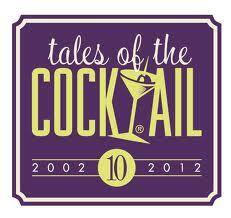 As a part of this years Tales of the Cocktail® 10thAnniversary celebration, the top four finalists per category are invited to attend the award ceremony on Saturday, July 28, 2012 at the Hyatt Regency Hotel in New Orleans. The finalists will travel from around the world to gather together and celebrate their positive impact on the cocktail world. Each award recipient will receive an exclusive Riedel Crystal trophy. Please see below for a complete list of the top four nominees according to category.